You have just shot an awesome video on your iPhone and want to share it on social media? For that you need to set it up with some cool music and effects so that you can wow your connections. Yet you may not want to log in to your iTunes and launch the laborious process for adding music to a video by extracting it from iPhone first. No, you are in no mood to wait for the time when you can get to your laptop or desktop to start editing. Time is of essence these days; a few minutes can mean a great difference between a social media viral wave and a dud post. 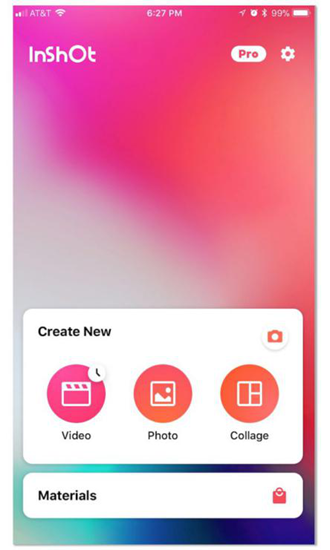 That’s why you need InShot, the magic photo and video editing app that can do wonders to your photos and videos directly on iPhone. It will spice up your most common captures into something remarkable, scaling the gap between the good and the great. InShot offers some cool new tools to bring out the best in every capture. Your video caught in the portrait mode looks tiny in the full screen? Don’t worry, you can easily center the video and add a peripheral blur to give a fuller feel. There are tons of filters and other effects that can really spice up a photo or video on iPhone. You can also choose to insert some texts or word art to even the casual effort, and also play with the tone, saturation, brightness as well as contrast levels to bring the video or photo in the right mood. There is a rich library of stickers and fonts to give you a perfect outcome on your iPhone videos. 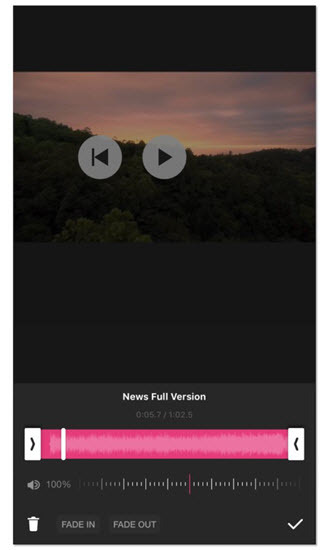 And here are steps to add music to a video on iPhone. Look for the InShot app in the App Store and download it. This is one of the best apps to put music on iPhone videos. Easy to install and use, the app offers an amazing range of options. Once you have finished the installation, launch it. You need to get the music file on your device before you can use it. So first locate the music or song file you want to add to the video. If the file is on your desktop or laptop, you may want to transfer it by email or cloud service beforehand and download it to your iPhone. After the song is sent by email, press on the file attachment to activate the downloading on iPhone. After downloading, you can easily share the file to InShot. InShot will automatically adds the music file to ‘Received Music’ folder in the app. 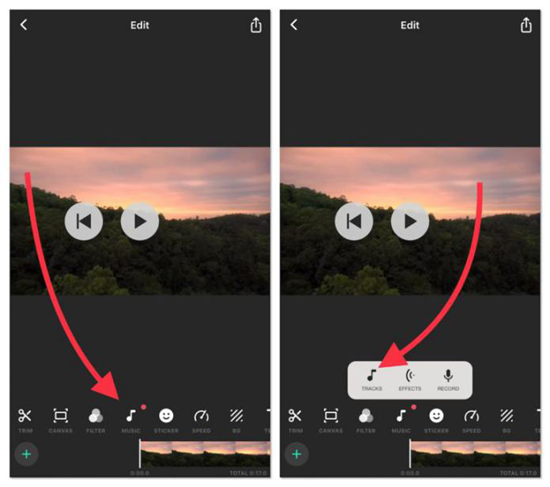 Then select the video you need from iPhone Photo Library by clicking “Video” in Create New. If the app adds margins or frames to the video by default, you can reset it by going to Canvas and choosing the options listed there. With the video selected, go to the Music folder under ‘Received Files’. You will see your tracks listed here. Tap on the file and choose the Use option. InShot instantly adds the music track to the video. Then you can use the pink bar to trim the track or create the fade-in or fade-out effects on the video. Now you can save the new video to the photo library by tapping on the Upload button on the top right-hand corner of the screen. The advantage with InShot is that you can let your imagination run wild and make it come ture. This app is characterized by its versatility and ease of use. You can tint crude videos on iPhone with this app for remarkbly better looking. A good way of finding suitable music of your iPhone videos, is by using a website -AudioJungle. The website has a wide variety of audio clips. The service is a paid one, but worthy because of the various offerings and ease of use. The AudioJungle mobile site allows direct purchase from your iOS device without computer. You can search the mood you want to create and it is easy to locate the appropriate audio file. The site has an extensive range of audio files fitting every mood conceivable and can be bookmarked. But remember to choose royalty-free tracks when you type in the search criteria to avoid some legal issues. The downloading comes as compressed zip files and you can use a zip file extractor app like iZip to extract the files on iPhone, for later importing to the InShot app to beautify your videos. Sometimes it happens that one accidentally wrongly trimmed her video on iPhone, but lose the option of untrimming. In such case, to recover a trimmed video on your iOS device, you need the powerful data recovery software – Gihosoft iPhone Data Recovery. 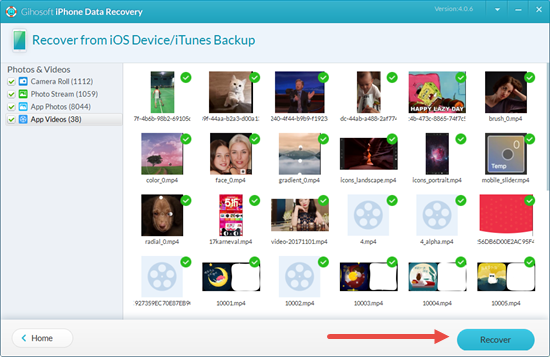 This software is exclusively built to recover various deleted/lost/trimmed data from your iOS device, supporting to recover deleted messages, contacts, photos, videos, notes, voicemails, etc. Step 2: Run the software and select “Photo & Videos”, then click Next. Step 3: Connect your iPhone to computer, or directly view your iTunes/iCloud backup. Step 4: After data scanning, you can preview the untrimmed video, and recover it to your PC. 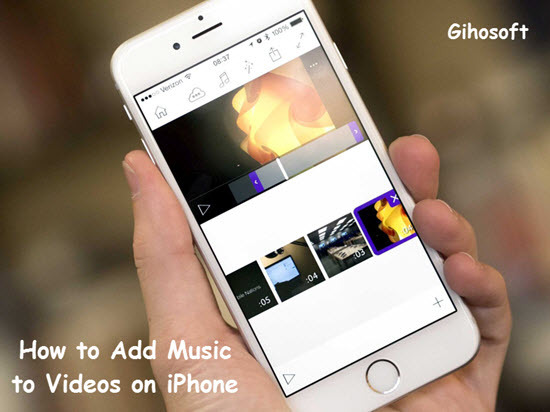 Though InShot does come out to be a great on-the-fly app useful in adding songs to video on iPhone, you must not expect it to be as elaborate as a full-fledged editing suit, since it does not have the same breadth and variety. Of course, for more heavy duty editing, you would do well to turn to your desktop applications. Yet it still help video editing become a breeze on iOS device. Adding music to a video on iPhone should not be a tough thing from the beginning, hence we offer this article for your convenience to sooth the possible anxiety. We hope that this guide is of help for you, and welcome your questions or suggestions in the comment below.